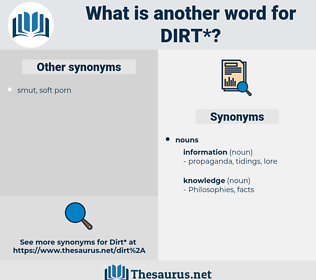 What is another word for dirt? Mud; filth; as, the streets are full of dirt; dust; garden earth. Soli, contamination, sludge, impurity, soil, Fouling, garbage, slurry, junk, filthy, manure, stardust. dirty, grime, debris, trash, land, sand, muck. purity, cleanliness, morality, sterility, pureness. decency, improved, cleanness, seemliness, primness, priggishness, spotlessness, Priggery, suitableness, prudery, perfection, prudishness, decorum, decorousness, appropriateness, fitness, suitability, puritanism, immaculateness, correctness. That's his nature - no allowance made if anybody does him dirt. Why, they are as common as dirt. 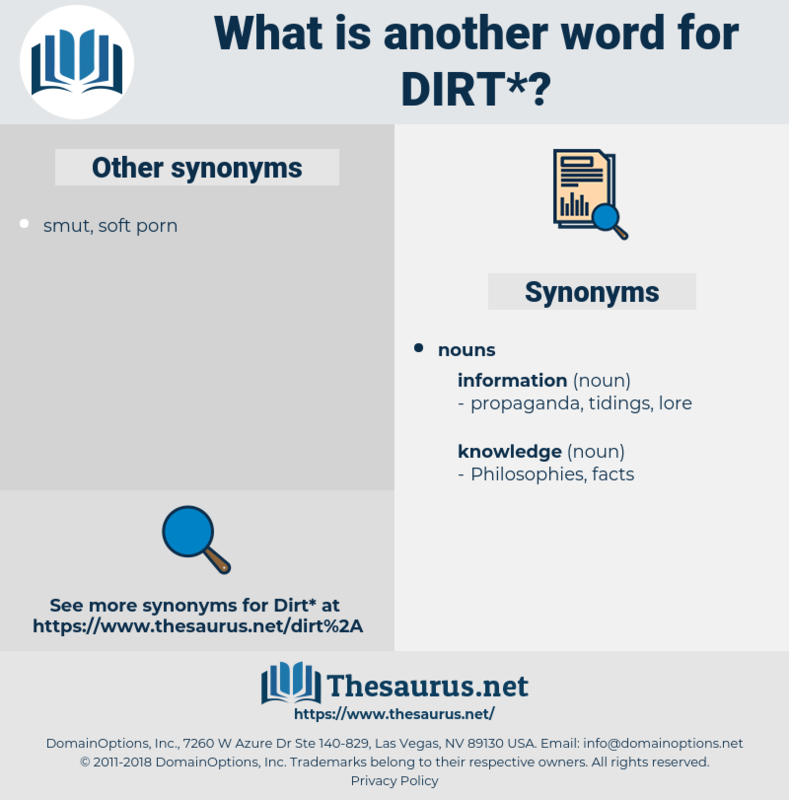 deteriorate, dearth, dard, death rate, dotard, de-aerate, dry rot, diderot, dehydrated, draw out, dried-out, die-hard, dart, dooryard, dry out, dreaded, dry-eyed, deaerate, dried, derate, dehydrate, derrida, dry-rot, deathrate, diorite, die hard, detroit, dread, deride, diehard, do-or-die, dirty, dowered, druid, data rate, dorado, Drouth, dryad. boulder clay, gumbo soil, loam, gumbo, marl, prairie soil, bog soil, Podzol Soil, laterite, humus, clay, till, silt, bole, regosol, caliche, alluvial soil, fuller's earth, podzol, Desertic Soil, residual clay, mud, Indian Red, clunch, Podsolic Soil, indurated clay, tundra soil, surface soil, podsol, sedimentary clay, mould, Podsol Soil, wiesenboden, sand, subsoil, undersoil, desert soil, residual soil, topsoil, mold, hardpan, Gilgai Soil, loess.